More than 8 in 10 (82 percent) business travellers think it is important for their safety for their company to know their travel plans in advance, yet less than half (47 percent) say their organisation has a system in place to capture their travel plans if they book outside of corporate channels, according to new research out today from the Global Business Travel Association (GBTA) in partnership with SAP Concur. “In an emergency situation, whether it’s a natural disaster or terrorist attack, I truly think businesses are responsible for their travellers’ safety. To react quickly and to be able to identify and locate employees within minutes is absolutely imperative. What this research shows is that solving this challenge, no matter whether travellers have booked via their OBT or outside of it, travel bookings should be made visible to the business,” said Pierre-Emmanuele Tetaz, Senior Vice President & General Manager EMEA at SAP Concur. Additionally, the study revealed 73 percent of travellers expect their company to proactively contact them within two hours of an emergency event. This comes despite the fact that the majority would not contact their organisation if they were in need of assistance, leaving the responsibility solely on the company. Expectations do not stop once the business portion of the trip ends. More than half (56 percent) of business travellers tacked on leisure travel to a business trip in the past year, and 31 percent expect their organisation to be responsible for traveller safety on added leisure days. In the past year over 80 percent of business travellers used their company’s online booing tool (OBT) for air and hotel bookings, making OBT use relatively consistent over the past two years. However, over two-thirds book air and hotels directly or through an online travel agency (OTA). In fact, rates of OTA use over the past three years are increasing more than rates of OBT use, which could indicate alternative channel use is on the rise. Convenience, selection or pricing are different reasons travellers indicate using alternative channels, however in many cases, non-corporate channels are not authorized within a company’s travel policy, causing significant duty of care concerns as well as missed cost-savings opportunities. 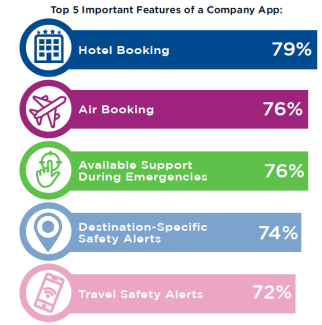 Beyond booking capabilities, an overwhelming majority of travellers want features that will keep them safe when using company-provided tools and apps. In looking at the next steps for innovation, most travellers are looking for technology that will make the booking process more personalized and efficient. The top five capabilities travellers want to see in the future of their company’s tools include: personalized booking (43 percent), pre-trip approvals and trip personalization (42 percent), intelligent expense reports (38 percent), automated expense audit (34 percent) and predictive intelligence (33 percent). A survey of 1,252 European business travellers in Germany (152), France (151), the UK (152), the Nordics (513), Belgium (155) and the Netherlands (129) using an online panel. This survey was fielded between September 21 and October 16, 2018 with respondents qualifying if they (1) were employed full-time or part-time, and (2) traveled for business more than once in the past year.